Typical heavily armed tracked vehicle (Russian T-90). Note high ground clearance and armor protecting tracks. AFVs may be either tracked or wheeled. Both systems offer various advantages and disadvantages. Wheels offer increased speed and range with decreased weight and operational cost. Tracks offers superior cross-country performance and a tighter turning circle. Both systems are prone to damage when attacked by kinetic energy or explosive rounds, with tires shredding and tracks being thrown. This article reviews the history of the developmental and employment of both wheels and tracks on AFVs. Experiences during WWII suggested to most nations that while wheeled systems were suited for transportation functions (i.e., jeeps and supply trucks), ground combat operations required the mobility capabilities offered by tracked systems. The relatively low ground pressure resulting from the use of a continuous and broad track makes them well suited to operations in off-road conditions such as sand, mud and rough terrain. 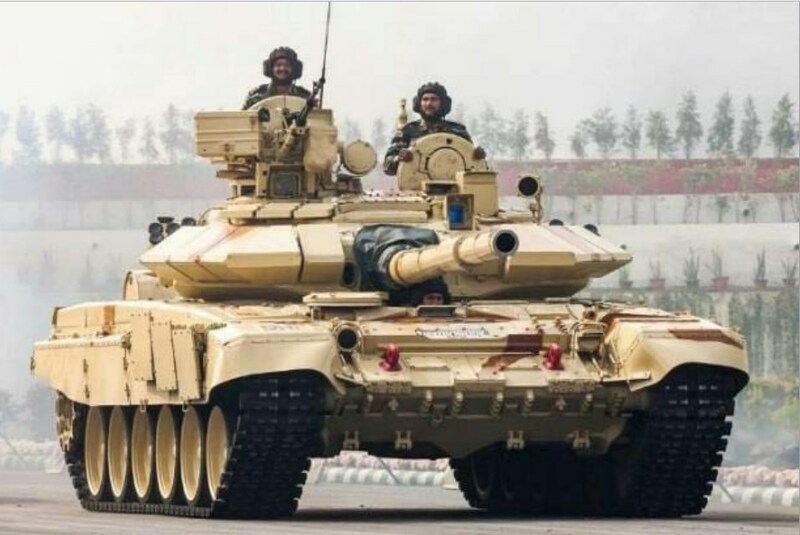 Tracked systems can also support a significantly heavier vehicle than wheels, making them the logical choice for Main Battle Tanks and heavy Infantry Fighting Vehicles. Following the war most nations chose to select the use of tracks for AFV development. Heavy combat vehicles such as tanks, self-propelled artillery and infantry fighting vehicles were predominantly designed as tracked systems. Wheels were reserved for logistical functions (i.e. transport trucks) and some specialized applications that stressed speed over cross-country mobility, such as reconnaissance vehicles for use in highly populated areas. A summary of the advantages of tracked combat vehicles is presented below. Can accommodate heavy armored vehicle designs, with many modern MBTs weighing upward of 70 tons. Current wheeled technologies limit overall vehicle weight to about 35 tons, and therefore are unsuited to heavy systems such as MBTs and self-propelled artillery. Supporting greater weight tracked vehicles can mount heavier weapon systems and armor systems, offering greater firepower and higher levels of protection. Tracks offer a stable firing platform as compared to wheeled vehicles when employing heavy weapons. The all metal construction of tracked systems offers less “bounce” or “swaying” in comparison to large rubber tires. Produce a lower ground pressure than most wheeled vehicles, improving performance in demanding terrain such as mud and sand. Average tracked vehicles only produce about half the ground pressure of a wheeled vehicle of equivalent weight. Offers superior overall tactical mobility, which is to say, the ability to respond quickly and decisively in an active combat situation with hostile forces. This includes both good off-road mobility and vehicle ‘agility’. Agility pertains to such aspects as speed, acceleration, turning circle and the ability to alter course quickly, which is often critical is taking evasive maneuvers. Typical lightly armed wheeled vehicle (USMC LAV II). Note propeller at rear (amphibious vehicle) and light weight of wheel integration. While most nations following WWII focused on the development of tracked armored vehicles. The Soviets pursued developing a wide range of both tracked and wheeled vehicles, leveraging the advantages that wheeled platforms offer for many battlefield applications. Wheeled vehicles offered the opportunity for rapid mobility, providing a critical strategic advantage. Though not suited to heavy combat vehicles such as MBTs, wheels did prove suitable for IFVs and APCs. Though generally not performing equivalently to tracked vehicles in actual combat situations or in rugged terrain, wheeled vehicles are able to move quickly about the battlefield. The capability of wheeled vehicles to rapidly move about a combat theatre provides a decisive strategic advantage. This flexibility permits reallocation of firepower more rapidly than an opponent without wheeled vehicles can respond to. In this manner the use of wheeled vehicles brings to the modern battlefield much the same advantage offered by light cavalry in bygone wars. The rapidly moving forces can be effectively used to provide flank coverage and flank attacks, to pursue a fleeing enemy, to disrupt an opponent’s efforts to consolidate forces, to quickly reinforce potential breaches in defensive lines, and to seize the initiative through rapidly responding to opportunities presented at enemy weak points (where tracked vehicles can be seen as the equivalent of heavy cavalry, being used to directly smash the opponent in head-to-head confrontations). As the significant advantages offered by Soviet wheeled vehicles became apparent America also decided to invest in wheeled combat capabilities. The key moment came when Russian forces were able to respond to the collapse of Yugoslavia much more quickly than NATO forces were able to. Though NATO forces were located more closely to Yugoslavia than the Russian forces, the Russians were actually able to occupy key strategic locations throughout the country days in advance of the arrival of NATO units. Where each NATO tracked vehicle had to be loaded and unloaded onto rail cars for transportation, the nimble Russian wheeled vehicles simply drove at high speed across Europe using the existing road systems. This example made the superior strategic position offered to Russia as a result of their use of wheeled vehicles painfully obvious to the NATO commanders. Consequently US Army Chief of Staff General Eric K. Shinseki drove the requirement for wheeled vehicles in the US inventory. His efforts ultimately resulted in the introduction of the Stryker Family of Combat Vehicles to the US Army. These fast and light-weight vehicles, used in conjunction with air transportation assets, provide the US Army the unprecedented ability to respond at a Brigade level to a military situation anywhere in the world within a 96 hour period. Ultimately countries have come to recognize that wheeled combat vehicles offer unique advantages and that a “mixed” force consisting of both tracked and wheeled vehicles provides military formations the maximum strategic flexibility and mobility on the modern battlefield. A summary of the advantages offered by wheeled combat vehicles is presented below. Wheeled vehicles use far less fuel than tracked vehicles when driving on roads, with this advantage decreasing with the ruggedness of the terrain over which the vehicle is driving. The consumption rate of other vehicle fluids such as oil is also reduced. Therefore the vehicles can travel farther without having to stop for refueling. Consequently the logistic train (i.e., trucks hauling fuel and spare parts to support operations) is reduced. Logistics provisioning is a major cost for modern armies, largely sets the pace at which forces can advance along a front, and are a huge liability, as unarmed trucks hauling materials to the front are vulnerable to attack. Valuable combat assets must therefore be stripped from the front line and assigned to protect them. Significantly reduced maintenance requirements compared to tracked vehicles. Wheeled systems do not see the high loads that occur in tracked systems, reducing maintenance down time, frequency of repairs, and need to stock a large supply of replacement parts. A higher proportion of a fleet is therefore available at any time to engage in combat duties. Also, for a given amount of funding more vehicles can be maintained and kept fielded. Maintenance costs are a major driver of overall military budgetary constraints. Wheeled vehicles are much faster than tracked vehicles, and able to travel for protracted distances using existing road systems without interruption. For example an 8×8 vehicle can drive at 60 mph on a road for many hundreds of miles without stopping. Tracked vehicles are not suited to travelling long distances. The wear on the track system is too high, and the vehicles begin to suffer breakdowns en-route. Engines overheat and the vehicles must be stopped periodically to cool down. 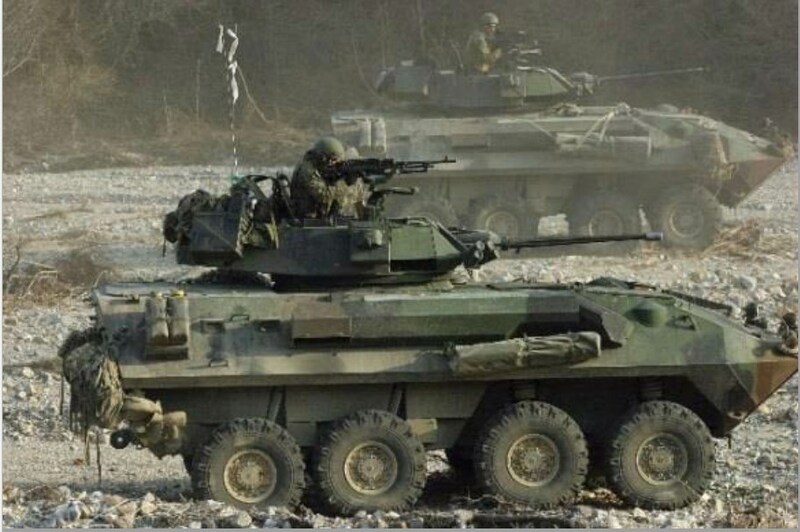 Wheeled vehicles offer superior ‘operational mobility’, which is the ability of a military force to quickly respond to a battlefield crisis (i.e., breach in defensive lines) or opportunity (i.e., breach in enemy lines). Wheeled vehicles actually provide a better mounting system for lighter weapons such as the 25 mm autocannon and ATGM launch systems due to the inherent stabilization offered by the rubber tires. This improves the performance of these weapons, minimally impacting aiming accuracy when firing while on the move. Though the turning circle of wheeled vehicles is larger than tracked vehicles, wheeled vehicles offer greater overall agility and are much more responsive to being driven that tracked vehicles. Wheeled vehicles are generally faster, accelerate more rapidly, and can weave and zig-zag better than tracked vehicles, all critical to taking evasive maneuvers to avoid being targeted or impacted by enemy forces. To exemplify this, consider how quickly you can respond to unforeseen events on the highway when driving your car as compared to operating a bulldozer. Occupants of a wheeled vehicle do not suffer from fatigue as quickly as those in tracked vehicles. The heavy vibration of tracked vehicles cause their crews to lose focus and transported troops to suffer body aches at a much faster rate than occupants in a tire cushioned vehicle. Passengers in many modern wheeled vehicles are provided the same level of comfort as might be typical for a bus or pick-up truck. Wheeled vehicles generally have superior survivability against mine strikes. Having a greater ground clearance to accommodate the suspension system, this distance proves critical in reducing the blast wave strength. More complex hull geometries can also be integrated into this increased space claim available under the vehicle, further mitigating blast effects. A 6×6 or 8×8 vehicle is still often road worthy following a mine strike. With only a single disabled wheel station the vehicles are often able to extract themselves from dangerous situations and in many cases have proven able to continue with the mission. Tracked vehicles by contrast are completely immobilized by a single track pin being sheared by a blast, which results in their throwing a track with any attempt to move. These vehicles render their crews vulnerable to subsequent follow-up attacks and often are abandoned to the enemy to scavenge or even re-deploy. This situation was commonly encountered during operations in Iraq, with ISIS taking possession of many marginally damaged tracked vehicles. Wheeled vehicles are much quieter than tracked vehicles. This makes them better suited to reconnaissance duties, permitting the vehicle to get closer to enemy forces without being detected. The low weight of wheeled systems facilities producing an amphibious vehicle, permitting crossing of rivers and waterborne launching of vehicles off naval ships. This entry was posted in AFV by MSW. Bookmark the permalink.